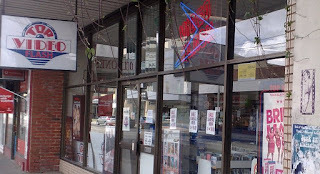 Tsai Ming-liang, outside Top Video Flash in High St, Northcote. Separating and letting go (from the herd, from false communion) may be obligatory steps towards individuation and becoming one’s own self—the key to the ultimate ability to break free, but increasingly this process reveals a terrible truth: our essential aloneness—even (and especially) from those we’re closest to. “I can’t do that, I am incapable of it. Perhaps you will be able to do it one day. It is difficult, it is the only truly difficult thing there is. I have often dreamed of doing so, but I can’t; the idea fills me with dread: I am not capable of standing so naked and alone. I, too, am a poor weak creature who needs warmth and food and occasionally the comfort of human companionship. Someone who seeks nothing but his own fate no longer has any companions, he stands quite alone and has only cold universal space around him . . . And actually this is the path one should follow. People like you and me are quite lonely really but we still have each other, we have the secret satisfaction of being different, of rebelling, of desiring the unusual. But you must shed that, too, if you want to go all the way to the end . . .” (Hermann Hesse, Demian, 1919; tr. Roloff and Lebeck 1970). “Every human being has his soul, he can’t mix it with any other. Two people can meet, they can talk with one another, they can be close together. But their souls are like flowers, each rooted to its place. One can’t go to another, because it would have to break away from its roots, and that it can’t do” (Hermann Hesse, Knulp, 1915; tr. Manheim 1971). Free me from the world. Setting us free from the world. With equal force attack our love? Is it not called Tristan and Isolde? If death were to be given to Tristan? Living only in our love! Ardently desired death in love! Ever sacred glow, freed from the misery of waking. Far from the day’s lamentations at parting! But the desire for eternal union, driven on a conscious level by the influence of the love potion the couple has accidentally drunk from and a belief in the enduring power of love, is no match for Tristan’s deeper desire: his inherent longing for death (a return to the inorganic absence of any life-tension, see Žižek 2002: 106). He cannot break away from its root. And in the final act, a wounded Tristan breaks the pact of the Liebestod: instead of waiting for Isolde to heal his wound so they might, as promised, surrender their lives together, he tears off his bandages and dies, alone, before her. “[The music] helps to shield the audience from the terrible truth that is known to Tristan. Overwhelmed by the flood of the music, the spectator will no doubt reconstruct for himself the utopian unity of the lovers” (Wagner 1998: 83-84). “In Tristan, the ultimate truth does not reside in the musical message of passionate self-obliterating love-fulfilment but in the dramatic stage action itself, which subverts the passionate immersion into the musical texture. The final shared death of the two lovers abounds in Romantic operas . . . this is precisely not what effectively happens—in music, it is as if the two lovers die together, whereas in reality, they die one after the other, each immersed in his or her own solipsistic dream” (Žižek 2002: 123). Lars von Trier is someone else who knows the terrible truth—making it (and the music from Wagner’s Tristan und Isolde) subject matter for his latest film, Melancholia. A film about the end of the world, it’s also an intimate portrait of two tortured souls, sisters Justine and Claire, dealing with their respective personal crises. The call to individuation for Justine is sounded by her sense of doom and downward slide into depression. Claire’s consciousness is roused when all her previously held beliefs and props break down in the face of the impending destruction of the Earth and humanity’s inevitable demise. Von Trier’s repeated use of the prelude from Wagner’s Tristan und Isolde aptly underscores the sisters’ torment and the planet’s doom (though the more I think about it, the more I’m inclined to agree with Alex Ross’s affront at von Trier’s relentless dwelling on the opening of the prelude that “turns [it] into a kind of cloying signature tune . . . [robbing] the music of its capacity to surprise and seduce the listener.” But then I, too, am guilty of relentlessly playing and replaying moments from the prelude, yet the music continues to seduce and astonish, so I’m also inclined to be forgiving). The earth is evil. We don’t need to grieve for it . . . Nobody will miss it . . . There may be life somewhere else. Because I know things . . . I know we’re alone . . . And when I say we’re alone . . . We’re alone. I read Justine’s initial torment as agony over the fact of individuation and her gradual silence, calmness and dispassionate acceptance of the impending doom as relief from selfhood into oblivion. The portrait of the two sisters is deeply moving and, as someone who normally doesn’t leave his negative energy behind, I am comfortable with the film’s “radical anti-anthropocentrism” (see Steven Shaviro). Von Trier’s vision of the end of the world was for me aesthetically and emotionally satisfying. But it’s Tsai Ming-liang who most forlornly envisions the terrible truth—giving the lie to our seemingly unfilmable, invisible, internal feelings. His early films (Rebels of the Neon God 1993 and Vive L’Amour 1994) centre on the inexorable loneliness of young, mesmerising, alienated, urban-dwellers and are fittingly described as “gorgeously glacial” (see Andrew Chan). In the ironically but optimistically titled Vive L’Amour, three lonely strangers, May Lin, a real estate agent, Ah-jung, a street vendor and Hsiao-kang, a cremation urn salesman, come together accidentally in an unusual love triangle. The film’s moody tone is full of melancholy – the characters are deeply lonely and unhappy. The final scene showing May Lin walking alone through a desolate park and then sitting down at a bench and giving way to a fit of weeping is devastating. It has troubled me since I saw it. Chan is right to describe the final scene as “audacious”, though he dismisses it as a “ten-minute sob-fest that comes off scripted”. I can’t agree. There is in that deeply affecting (actually, six-minute) finale something that reveals the unrelenting truth of our essential aloneness. 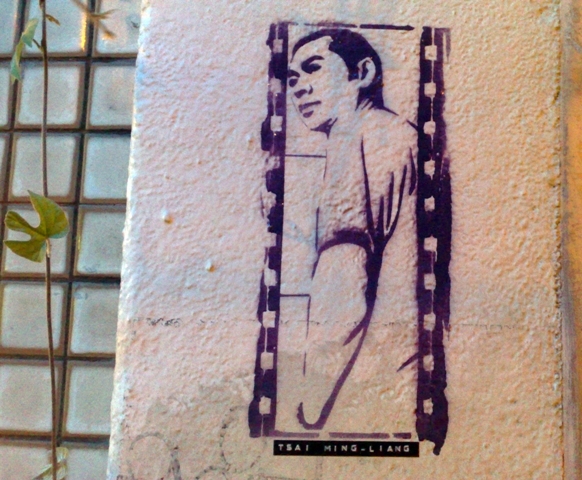 However, comedy is also a central element in the films of Tsai Ming-liang – in the characters themselves and in the chance encounters between them. Jared Rapfogel contends the comedy “lies in the way [Ming-liang] shows us what his characters cannot see—that though they may feel lonely, in fact they’re not nearly as separate as they think . . . Life is a comedy for Tsai because, from his point of view, people are so far from each other yet so close; they feel trapped in a bottomless solitude, while others crawl by inches away . . . a universe full of unfulfilled, often unconscious connections”. The possibility this optimistic notion suggests—that our sense of isolation and despair may not necessarily (have to) be unshared—is something I would like to address in my next blog entry.